Damn nice water and godrays. AMIGGAAA! Awesome water effect in 4k! The source code is included for educational purposes :) Enjoy! And thanks for the comments so far. Looks so lovely - but it has a problem, and this is called: Elevated! Great code. The ball was a bit misplaced. kaoD: This intro requires a shader model 4.0 GPU (nVidia 8xxx / ATi HD 2xxx or greater). We recommend running it at 640x480 if you don't have a GTX 2xx or HD 48xx. 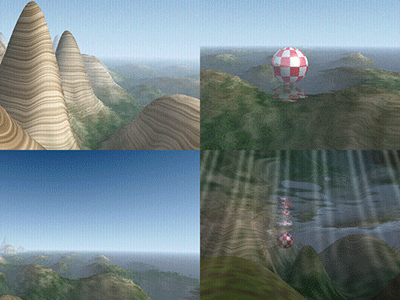 raymarching, terrain, water shader, cameras, AMIGAAAAAAA ball! Slow-ish but really nice looking. I was really surprised by Renoise music in 4k-intro! Thumb up for that. But the rest is very good, and thanks for releasing sources. please give a capped link. good 4k with source, wtf? Very decent intro - enough for a thumb! I like that there actually was some underwater feeling, when going into the water! Oops, sorry, wrong link: this is the right one. I'm being just stupid now: http://blu-flame.org/files/valleyball_1280x720.avi here. Someone invent something better than copy/paste, doesn't seem to work with me. i LOVE this intro :) really rulez ! nice ball-movement and it never touches the landscape at any point ! rulez added on the 2009-04-16 23:35:19 by ɧ4ɾɗվ. Slightly cheesy but nicely done! The cheesy amiga ball destroys the whole intro for me. The cheesy amiga ball spices up the whole intro for me. everything can be sold with naked women... or amiga balls! It looks nice and clean but feels a bit repetitive somehow. More variational flow needed. Linux + SRC = Thumb UP! Very nice stuff! Cute water shader, and thumbs up for the source anyway. something beautiful in this demo. A <16Kb for Win32 AND for Linux? ... with source?... And an Amiga Ball? Great! Extra thumb up for releasing the very clean source code. Nice one, though such a misfortune for the first proper terrain in 4k ordeal ;). Thumb for the source code! How was the Linux version compiled? Only the Windows source seems to be included. that amiga ball ruins it. it makes no sense. page created in 0.020664 seconds with 15 queries.